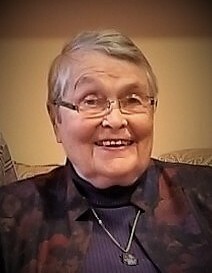 Jeannine Anne (Ahlgren) Van Gorp died November 24, 2018 at Givens Estates Health Center, Asheville, NC after a valiant effort to defeat Alzheimer's. Jeannine will be remembered for her infectious smile and a giving heart, both which she dedicated to her family and church. Humanitarian issues were her focus as well as the search for peace. Jeannine's values were apparent in her work with the United Methodist Women, P.E.O., and through service as a Director of Evangelism, founder and director of community volunteer action centers, involvement in literacy programs, intercity missions, Habitat for Humanity, disaster response and refugee service, and numerous UMCOR programs both nationally and abroad. Jeannine and Darwyn, husband of 68 years, met at Iowa State College in 1949, but her Home Economics Degree was completed at the University of Missouri in 1975. Jeannine later studied at St. Paul's Theological Seminary, Kansas City, MO and received her Evangelism Certification in 1986. Jeannine loved to travel, particulary when she could experience other cultures. She enjoyed interacting with people and was eager to work side-by-side with individuals of all stations. She was an unwavering advocate for those in need and ardently pursued her calling. She was loved dearly by many and will be missed by all. Jeannine was born October 3, 1930 in Davenport, IA, daughter of the late Oscar A. and Edna Marie (Snyder) Ahlgren. She is survived by her husband, Darwyn A. Van Gorp of Asheville, NC; one brother, Harlan Ahlgren of Menifee, CA; five children, Susan Davis of Albuquerque, NM, Dirk Lackovic Van Gorp of Yellow Springs, OH, Peter Van Gorp of Springfield, MO, Paul Van Gorp of Roanoke, TX, and Craig Van Gorp of Kansas City, KS. Jeannine has 8 grandchildren and 5 great-grandchildren. A brother, Robert Ahlgren, and a sister, Marilyn Sarchett both preceded Jeannine in death. A Celebration of Life Service will be held in Pulliam Chapel at the Givens Estates, 2360 Sweeten Creek Road in Asheville, NC on Friday, December 28 at 2:00 PM. The family requests that, instead of flowers, donations be made in Jeannine's name to Memory Care, 100 Far Horizons Lane, Asheville, NC 28803 or Care Partners Foundation, 68 Sweeten Creek Road, Asheville, NC 28803.